You need to know everything about your prey to be a successful spearo. Know what your targets look like, not only at the surface or in bright shallow waters, but also at 66 feet / 20 meters, or deeper with nothing but dim blue or violet light. The red, orange and yellow colored fish will filter out and look white or gray, even in just moderate depths. A first time spearo is usually surprised to see a speared fish bleed green blood! What distinguishes your prey from other fish? What does the fish’s silhouette look like broadside, head-on, or from behind, and how about skin texture? Sometimes a rocked-up fish will only afford you a small window of view before you must make your decision to shoot. You can find online illustrations and often photos of reef, pelagic & coastal species fish for the areas you plan to hunt. For example in Florida state waters go to the website www.myfwc.com, where you will also find the state saltwater fishing regulations. 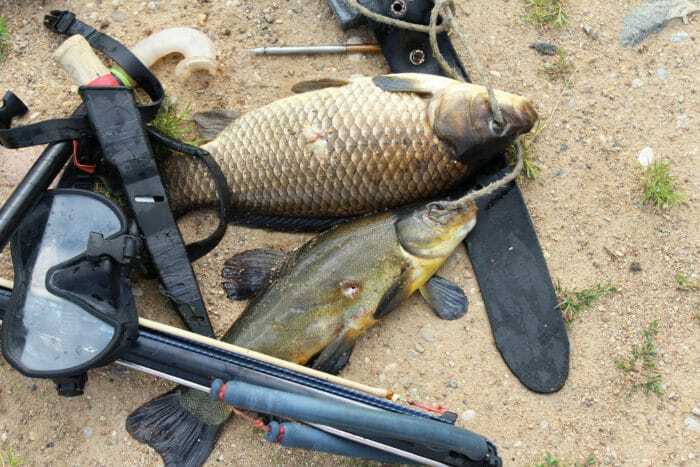 In Florida, you can’t spearfish in fresh water, and myfwc.com also posts all the state spearfishing regulations, which often vary from hook & line fishing regulations. State fishing regulations often vary by the body of water as well, for instance, Atlantic regulations often vary from Gulf regulations. You will need to recognize the legal length of all the fish you hunt, from various distances, because most fish will not let you get very close. One good rule to follow is to shoot only if you are sure you will be proud of your catch, and when in doubt, don’t shoot! Many fish are very quiet, especially the highest prized species, but some are very noisy. Goliath grouper, for instance, can sound like the tympani section of a large orchestra, especially when they feel intruded upon. Many reef fish make clicking sounds and some croak or make grunting sounds. The reef itself is a very noisy place, and it will be crackling with corals, shrimp, and fish. Remember sound travels four times faster in the water, making things sound closer, but it also takes away our ability to hear the direction of the origin of the sound. If you are searching for the reef but not yet seeing it, you can listen for an increase in volume which means you are headed towards it and getting closer. If it’s getting softer, turn around and check another direction until the volume does increase. Also look for reef fish and follow them, they’ll take you right to it. Also good to know, is what sounds might attract certain kinds of fish, or conversely might spook them away. Clicking a knife or a stringer on a spear shaft can attract schools of amberjack on a nearby wreck. A low throaty swallowing sound is nicknamed a “grouper call”, and sometimes it works, especially for less wary species like red grouper. Mutton snapper is particularly fond of lobster and often come in on divers catching bugs. Rubbing the base of an antenna down a plate below a spiny lobster’s eye makes a wrenching sound that often attracts muttons and sometimes groupers as well. Otherwise, it is usually best to be as silent as possible underwater because many of our top prey will leave before you even get to see them. 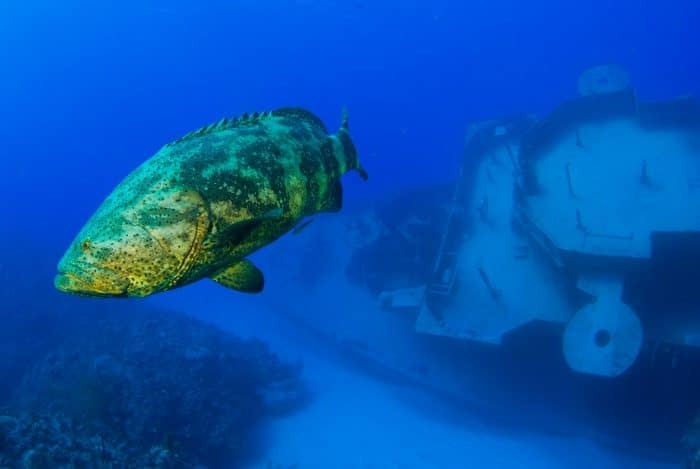 I remember freeshafting and stoning a 25-pound black grouper on a deep wreck near the Dry Tortugas many years back. The shot hit the grouper’s spine hard and made a solid punch-like sound, which caused a much bigger fish to spook for a second. When the big flat-tailed fish saw me glance at him, he bolted into the wreck. I guessed I was stalking a monster gag grouper and aimed my second gun where I thought he might peak out. (I had brought another gun with me, already loaded and rigged for amberjack on the ascent.) The fish was curious and when he looked out, that was his downfall. I fired, but he dodged the headshot and I hit him in the back, with the giant slip tip on the shaft holding him securely. As I pinned down the shaft, my prey was slashing around and biting the sandy bottom with huge canine teeth. That was no gag, it was my first cubera snapper, and silver dollar sized scales were flying off him as we wrestled. He weighed 54 pounds, and I had this magnificent cubera mounted, including those glorious jaws. Later I named my 36-foot sport fisherman “Cubera,” in his honor. Some fish are highly aware of their surroundings and have very long flight distances, while others may show little caution or fear. Many snappers will look similar at depth, but often it will be their behavior that will set them apart, and it’s important to identify them because size regulations vary by species. For example, in Florida, a mangrove (or gray) snapper has a minimum size limit of 10 inches, but a cubera snapper must be 12 inches and for mutton snapper, it’s now 18 inches, (a new size limit). Mangrove snappers will rarely be alone, in fact, they often are found in schools of a dozen or more, and they love to hang close to, and pop in and out of reef or wreck structure, like bees buzzing around a hive. They are very inquisitive and usually, only large mangroves are spooky and avoid approaching divers. Sizes range from less than 1-pound to 18-pounds, a new world record. Cubera snappers are usually loners, rarely seen in pairs, and are very spooky, often using camo to hide before a diver approaches. They like wrecks, sinkholes, and large reef structure. Commonly cubera are over 30-pounds and up to a new world record 122.4-pounds. Mutton snappers are sometimes loners or found in small numbers, often preferring to patrol by structures out in the sand, rather than hiding in the structure. They are inquisitive, but usually only make one pass by a diver and keep their distance. Muttons are commonly seen barely over 1-pound, around 12 inches long and often above 15-pounds, the new world record being 27-pounds. One of the best ways to learn fish behavior is to read spearfishing stories written by experienced spearfishing men and women. 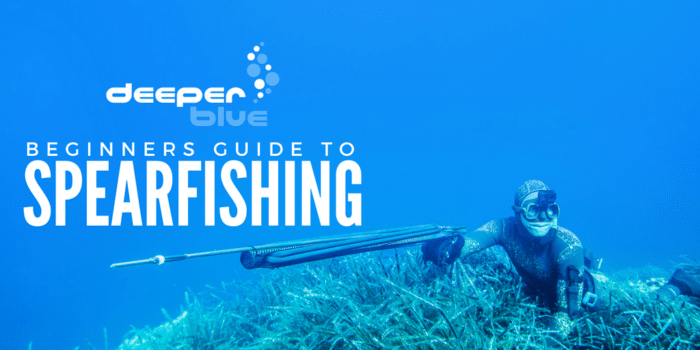 There are forums like Deeper Blue which have spearfishing sections where you can find many articles written by famous spearos. There are many spearfishing books also available online, and at some dive stores. Some of my favorites are Last of the Bluewater Hunters Full Disclosure: We earn a commission if you click this link and make a purchase, at no additional cost to you. by Carlos Eyles, Art Pinder King of Sling Full Disclosure: We earn a commission if you click this link and make a purchase, at no additional cost to you. by Sheri Daye, The Helldivers’ Rodeo Full Disclosure: We earn a commission if you click this link and make a purchase, at no additional cost to you. by Humberto Fontova, and Bluewater Hunting and Freediving by Terry Maas. Spearfishing magazines have come and gone, but the longest running and still current of all in the USA is Hawaii Skin Diver. 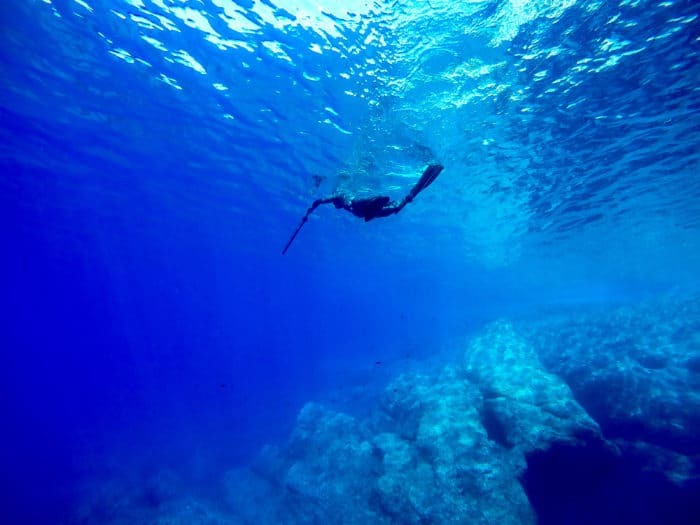 One of my favorite sources to read about spearfishing is the International Underwater Spearfishing Association, which of course contains the statistics of the world records of spearfishing since 1950. Best of all it has photographs of the fish and the divers, and many also have the stories written by the record holders about the fish they shot to set the records. Knowing the behavior of your prey can greatly assist divers to decide what kind of equipment to use for the hunt, and how to use it. Or it can aid shooters to make a change in the choice of prey, due to a lack of the proper gear, adverse conditions, or the lack of experience of the divers to handle the particular species. For example, recently a couple new freedivers stopped in our dive shop and said they wanted to hunt cobia because they heard at a marina that the “brown bombers” are running down the coastline. They asked me about spearing cobia and I told them, that they are some of the toughest fighters that divers can spear. Cobia must be 33 inches long in Florida to be legal and they commonly are much bigger and very powerful. I recommended getting detachable slip tips with new threaded shafts, to keep them from bending their flopper shafts or easily having their fish tear off. Cobia is one of the few fish that will play possum when first hit, and wait to explode when the shooter puts pressure on the shaft. At a minimum, reels are necessities for freedive spearguns or floats and bungeed float lines are probably even better. Having a buddy put a second kill shot in the fish is also prudent if it’s still at depth, or otherwise, have your stiletto knife easy to reach and avoid their sharp dorsal spines if you choose to have a surface wrestling match. They decided that the cost was more than they could swing right now, and I said it’s probably a wise decision to spend more time stalking and shooting easier marks like hogfish or sheepshead and learn to secure and take out these more reasonable sized prey before going for the real brutes. Regardless of your experience level, when you travel to hunt, you will find some new species and terrain that make it wise to find out how the locals shoot fish. For me, the oil rigs of Alabama, Mississippi, Louisiana and Texas in the early and middle 2000s were my last novel spearfishing experience. I found a few individual rig mentors in AL and a whole club in LA called the Helldivers that made learning their styles of spearfishing lots of fun and very successful. I’ll tell you more about them in other sections about rig diving and competitive spearfishing.